Black Friday is the name of a discounted shopping festival which occurred right after Thanksgiving to provide ultimate shopping experience with huge discounts and benefits. It comes in the last week of November every year. As the year comes towards the end and people start preparing for Christmas, the Black Friday Sale deals set by all retailers across the world to open up the massive sales on discounts. People usually start buying stuff from this mega event for Christmas. The black Friday offers products of all kinds from household accessories, electronic appliances & big consumer items, everything is on discounted price at this gigantic event. This shopping bonanza is a one-day sale that starts early in the morning and ends at night. Friday Bazar offers sale for an entire week instead of one day. This festival is for a whole long week that gives the luxury to shoppers to avail remarkable discounts throughout the week. America sellers were used to selling products with less profit in one day of the year. This day comes after Thanksgiving Day which comes at the last Thursday of November. In Thanksgiving Day Americans exchange gifts with each other and enjoy the public holiday in next day. Their holiday becomes more valuable to make it as a shopping day of the year. Sellers offer Black Friday Deals on products of their stores and forget about their profit. This Friday become Black Friday for sellers and retailers but White Friday for many peoples who are willing to celebrate their Christmas in the perfect way. This day peoples shop for Christmas Day and purchase many things to decorate their home for celebrating the religious day. They also buy expensive dresses for them at less price to look catchy. Black Friday is now celebrating in other cities as well either there are not any public holiday. Peoples of other countries manage time in their busy day and make a plan for shopping with family and friends to shop items at good price. Black Friday Sale in Pakistan is getting popularity from the last couple of years, demonstrating its success and acceptance by shopping paramours out there. It is highly surprising that such an event is getting more important to the people of Pakistan and leading brands are offering discounts as much as 50 to 80%. The shoppers from the different cities of Pakistan are relentlessly waiting for this enormous event. It is rush hours in a market as everyone wants to buy their favorite item before it runs out of stock. Shopkeepers and retailers maintain their stock for that day but huge demands in a market can bring the situation of shortage of the stock. This year different shopkeepers again set Black Friday Deals 2018 to celebrate shopping trend and they're also ready to face a huge rush. Attractive Black Friday Sale capture a huge market that's why a crowd of peoples looking to shop through ideal Black Friday 2018 Deal. You can make it white Friday by purchasing goods through an online store and save yourself from the crowd. You don't need to scare from the shortage of stock because you can place your order and online stores arrange that product for you at any cost. White Friday Deals at the online store makes shopping as an easy activity and anyone can avail discount very easily. You heard the different name of Black Friday at different stores which include Blessed Friday, White Friday, Big Friday, Good Friday and many more. iShopping.pk titles this event as a Friday Bazar by considering the trend of Bazar in a different area of Pakistan. You can get a huge variety of products at a discounted rate at Friday Bazar and enjoy Black Friday Online Shopping. Black Friday 2018 Deals isn't for only one day because its expended duration at iShopping.pk makes it as a Big Friday Deals. You can shop throughout the last week of November from iShopping.pk to avail Black Friday Sale. By keeping the importance of local Bachat bazaars that occur weekly for regular shoppers in Pakistan to buy things at very convenient prices that includes Sunday (Itwaar Bazaar), Tuesday Bazaar and Wednesday Bazaar (Budh Bazaar). We have derived the name Friday Bazaar to hit the sense which influences customers to love and to go for such bazaars. iShopping.pk is a highly anticipated online shopping portal which is always striving to deliver best quality products in Pakistan and we are expediting millions of customers with our proficiency for making original brands available for the people of Pakistan in affordable prices. 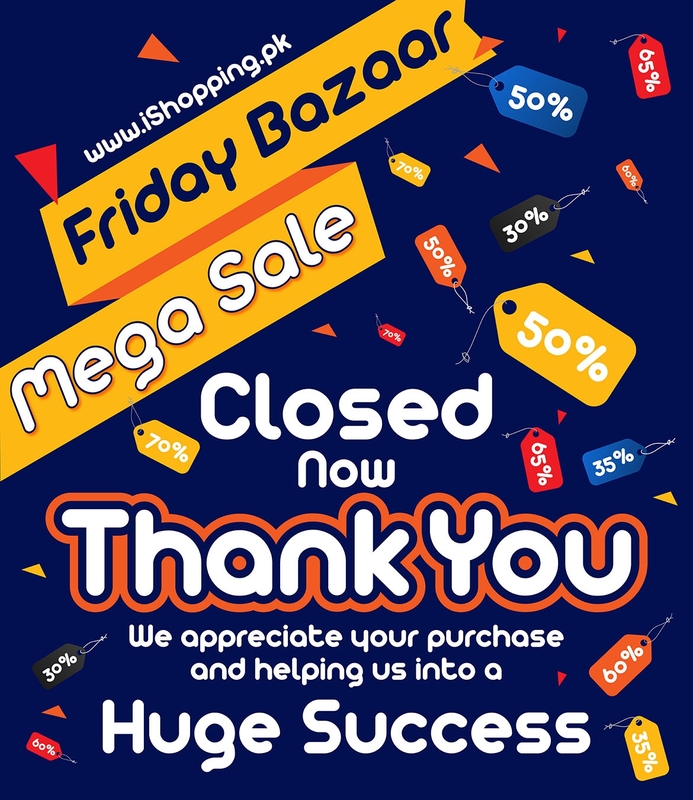 In Friday Bazaar we are going to deliver you the best of online shopping at this time of year where you get feel of celebrating Black Friday in Pakistan. What we are Offering On Friday Bazaar? And a great deal of other excellent merchandise that we have to offer in this ongoing event. For online fanatic iShopping.pk brings in the best possible extravaganza of Black Friday in Pakistan in the name of Friday bazaar. So hurry up and do not miss out this spectacular event and stay tuned to grab your favorite products at the lowest prices this year.